Gulshan Kumar Dua (5 May 1956 – 12 August 1997), known professionally as Gulshan Kumar, was the founder of the T-Series music label (Super Cassettes Industries Ltd.), and a Bollywood movie producer. He founded T-Series in the 1980s and established it as a leading record label in the 1990s. In 1997, he was murdered by the Mumbai underworld syndicate D-Company. After his death, T-Series has since been run by his younger brother Krishan Kumar and son Bhushan Kumar. His daughter Tulsi Kumar and Khushali Kumar are also famous playback singers. Gulshan Kumar Dua was born into a Punjabi Hindu family. He was the son of Chandrabhan Kumar Dua, a fruit juice vendor who worked the streets of the Daryaganj neighborhood in the heart of Delhi. Dua started working with his father from an early age. He was a devoted worshiper of Shri Shiv Ji and Devi Parvati, as he was a follower of the Shaiva tradition of Hinduism. Dua changed career paths when his family acquired a shop selling records and inexpensive audio cassettes, which foreshadowed the onset of a vast music empire. Gulshan Kumar started his own audio cassette operation known as "Super Cassettes Industries," which turned in to a profitable business. He began a music production company in Noida. As his business started growing, he moved to Mumbai. His first movie in Bollywood was Lal Dupatta Malmal Ka in 1989. Next was the big hit Aashiqui in 1990 which is remembered for its music by Nadeem–Shravan. His other movies included Bahaar Aane Tak, Dil Hai Ke Manta Nahin, Ayee Milan Ki Raat, Meera Ka Mohan, Jeena Marna Tere Sang and Bewafa Sanam. During the life of Gulshan Kumar, T-Series emerged as one of the top music labels in India. It continues to be a major label. Today T-Series controls more than 60% share of the Indian music market. In international market, T-Series enjoys a turnover in excess of $4.2 million, and exports to 24 countries across six continents. In India, it has the largest distribution network of over 2500 dealers. 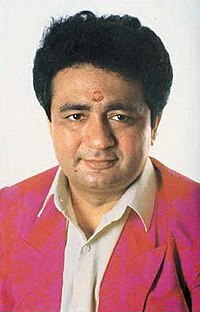 Gulshan Kumar Dua lost his life in a shooting outside the Jeeteshwar Mahadev Mandir, a Hindu mandir dedicated to Lord Shiva of which he attended daily in Jeet Nagar, Andheri West suburb of Mumbai, on 12 August 1997. He was shot 16 times. On the day of the asssination, his bodyguard, provided by the Uttar Pradesh government was sick. Although he had received two threatening calls, on August 5 and August 8, 1997, Kumar refused to pay the extortion money. The hired killers, including Rauf and Abdul Rashid, conducted reconnaissance for a month, but did not proceed because of the armed bodyguard. At 10.40 a.m., while returning from the temple, he was confronted by one of the assasins who said: "Bahut puja kar li, ab upar ja ke karna (you have done enough puja, now do it up there)." Initially Kumar survived and sought shelter in nearby huts, but residents shut their doors. His driver Suraj was shot in both legs as he tried to shelter kumar. An Mumbai underworld organization called D-Company is considered to have been responsible for this assasination. The police also accused film composer Nadeem Saifi of the music duo Nadeem-Shravan of having paid for the murder due to a personal dispute and fled the country after the murder. However, on 9 January 2001, Abdul Rauf Merchant (known as "Raja") confessed to being the murderer. On 29 April 2002, Sessions Judge M. L. Tahilyani sentenced Rauf to life imprisonment, stating that he was not imposing the death penalty because the prosecution had failed to prove that Rauf was a contract killer. The police alleged that Saifi paid Abu Salem, a known associate of Dawood Ibrahim, to assassinate Dua and assigned Rauf to the job, but it just so happened that Ibrahim and Abu Salem were already planning on murdering Dua as he had refused to pay protection money to D-Company as part of an extortion attempt. As per his family's wishes, Gulshan Kumar Dua was cremated in a shamshan (cremation ground) in Delhi. After the police's allegations against him, Nadeem Saifi had fled to the United Kingdom. In 2001, the case was taken to the London High Court, which rejected the Indian government's request for extradition on the ground that there was no prima facie case against Saifi. In August 2001, the prosecution's main witness, Mohammed Ali Hussain Shaikh, who had earlier claimed Saifi participated in the murder, eventually claimed that he didn't know Saifi and had never seen him. Abu Salem also denied Nadeem's involvement on Indian national television. Saifi was also exonerated by four courts, including the House of Lords in the United Kingdom and the sessions court in Mumbai. Saifi eventually acquired British citizenship, and later moved to Dubai, where he runs a successful perfumery business. Abdul Rauf alias Daud Merchant was convicted in 2002 for the murder of Gulshan Kumar. He fled India after he was granted furlough by the Bombay high court in 2009. He was extradited from Bangladesh in 2016. He is currently in the high-security Arthur Road jail in Mumbai. In late 1980s and early 90s Bollywood was impacted by the Mumbai mafia dominance and extortions. The influence of organized crime in the film industry was such there were regular reports of film stars attending events hosted by mafia bosses and allegedly enjoying their patronage. It is believed that Gulshan Kumar had refused to pay extortion to gangster Dawood Ibrahim. In 2017, T-Series announced plans to produce a biopic about Kumar titled Mogul – The Gulshan Kumar Story. ^ "Killing of Gulshan Kumar Reveals Mumbai Underworld's Nexus with Bollywood is Turning Nasty". India Today. 25 August 1997. Retrieved 2 February 2019. ^ Gulshan Kumar British Film Institute. ^ About Us T Series Official website. ^ "बॉलीवुड का सबसे विख्यात और 'कुख्यात' म्यूजिक मैन, जिसे मार डाला गया [Bollywood's most famous and "infamous" music man, who was murdered]". The Lallantop (India Today Group). 30 December 2016. Retrieved 16 April 2017. ^ a b "Gulshan Kumar Biography - Gulshan Kumar Profile, Childhood, Life, Timeline". www.iloveindia.com. Retrieved 18 October 2015. ^ Gulshan Kumar shot dead, scare in filmdom Archived 5 May 2009 at the Wayback Machine The Indian Express, 13 August 2001. ^ Prakash, Aryan. "Gulshan Kumar murder mystery: Recalling the day when 16 bullets were pumped into him". Inuth. Retrieved 10 March 2019. ^ Stunned silence at Super Cassettes' Delhi factory The Indian Express, 13 August 2001. ^ "Mogul first look: Akshay Kumar to play Gulshan Kumar. Who was Gulshan Kumar?". Indian Express. 15 March 2017. This page was last edited on 24 April 2019, at 10:52 (UTC).